Rig David, Director of CRS, together with Rt. Rev. Ashoke Biswas, the Bishop of Kolkata, who serves as the Chair of CRS, and Rev. Abir Adhikari, Presbyter of St Paul’s Cathedral and Vice Chair of CRS, were invite to visit Canada by Archbishop Melissa Skelton of the Diocese of New Westminster in British Columbia. The visit in May 2018 was an opportunity for the visitors from Kolkata to meet many supporters in the greater Vancouver area, and also attend the Canadian Friends of CRS annual Penny Pot Tea. 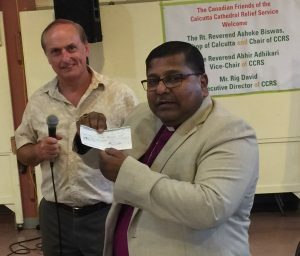 Among the donations was a cheque from the Men’s Club at St Marks Church in Surrey, here being handed over by Bob Pederson to Bishop Biswas. 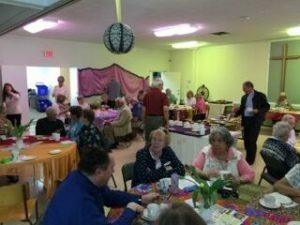 The Canadian Friends of CRS held their 6th Annual Penny Pot Tea on 2nd April. 72 people gathered at the Church of the Holy Trinity in White Rock, British Columbia, to see the 2015-2016 Penny Pots opened. Over the last year supporters had been putting nickels, dimes, quarters, Loonies and Twoonies in their pots. An incredible C$2,000 was raised. To this was added a further C$3,000 from cheques received from other donors. These funds will be transferred to CRS in Kolkata shortly. During the tea party everyone enjoyed sharing refreshments together including Indian “chai”, Keith’s popular cucumber sandwiches and cakes that guests had brought. Many also took part in a “spin to win” wheel to win Vancouver’s famous Purdy’s chocolates. Items made by women from CRS’s empowerment programme were also for sale. The Canadian Friends of CCRS held their annual Penny Pot Tea at St Mary’s Church, Kerrisdale on 14 March. Around 50 supporters came along and the “penny pots” were collected. A total of 1,924 Canadian dollars had been raised through the year as people had put loose change in their pots. All of this money will be transferred to CRS in Kolkata to be spent where the need is greatest. Thanks to the Canadian Friends for all their fundraising efforts! Sheila Johnston, founder of the Canadian Friends of CRS and Simon, her husband, visited the CRS Training Centre for Differently-abled Persons as well as the slum projects at Bibibagan, Basanti Devi, Pallymangal, Kolabagan, Dumdum and Topsia where CRS is working. Sheila and Simon were given a wonderful welcome at every centre. This was Sheila and Simon’s first visit to CRS projects which has made them all the more determined to work hard to develop things further in Canada to support CRS to help make a difference.